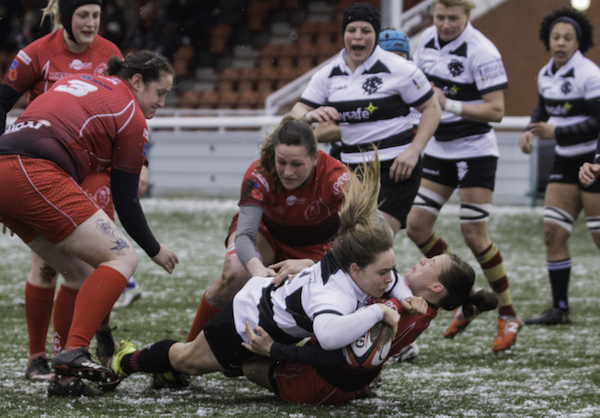 Jess Wooden had her big moment over the weekend as she started for the Barbarians. It's a fantastic honor for a fantastic player to become the first American to play for the side. Other than that it was a fairly quiet weekend. Both Saoisi Mahoni and David Tameilau started for Narbonne in the Pro D2. Eric Fry also saw time in the Pro D2. The other Americans that saw time were in the RFU Championship and in Ireland. Chris Wyles, Titi Lamositele, and Saracens had the weekend off. Chris Baumann and Leicester had the weekend off. Joe Taufete'e, Andrew Durutalo, and Worcester had the weekend off. Taufete'e is injured. AJ MacGinty and Sale had the weekend off. MacGinty is injured. Nick Civetta and Newcastle had the weekend off. Blaine Scully was not in the line-up for Cardiff as they beat Benetton Treviso 31-25 on Friday. Ronnie McLean started and played 80 minutes for Richmond as they beat Nick Civetta and Doncaster 22-12 on Saturday. Civetta was not in the line-up. Dino Waldren came off the bench and played 38 minutes for London Scottish as they lost to Jersey 52-19 on Friday. Robbie Shaw was not in the line-up for Hartpury as they lost to Cornish Pirates 45-20 on Saturday. Thretton Palamo was not in the line-up for Bristol as they beat Rotherham 24-3 on Saturday. Will Hooley and Bedford had their match against Nottingham postponed. Pierce Dargan, Roman Salanoa, and Old Belvedere had the weekend off. Tim Maupin and St. Mary's College lost to UCD 23-7 on Monday. Kevin O'Connor, Alex McDonald, Will Sims, Liam Smith, and Trinity beat Young Munster 21-19 on Monday. Kalei Konrad and Terenure College had the weekend off. Jess Wooden and the Harlequins had the weekend off. Wooden played for the Barbarians. Samu Manoa came off the bench and played 25 minutes for Toulon as they lost to Oyonnax 29-26 on Saturday. Dave Ryan started and played 57 minutes for Agen as they lost to Bordeaux 15-10 on Saturday. Eric Fry came off the bench and played 25 minutes for Vannes as they beat Colomiers 37-0 on Friday. David Tameilau and Siaosi Mahoni started for Narbonne as they lost to Carcassonne 52-17 on Friday. Mahoni played 80 minutes minus a yellow card while Tameilau played 59 minutes. Christian Ostberg was not in the line-up for Aurillac as they lost to Biarritz 38-16 on Friday. Roland Suniula started and played 90 minutes for Reggio as they lost to Lazio 33-31 on Sunday. Graham Harriman and James Bay lost to UBC 52-19 on Saturday.